This article is the second in an ongoing series on how to launch indie games. Missed part one? Read it here. Your game’s website is possibly the most important piece in your marketing puzzle. It’s where you can best showcase your game, without the limitations of marketplaces and distribution channels such as Steam. Think of your website as a direct line to potential customers where you can present your game in exactly the way you want to. Your site is also your best chance for building a following, both before and after launching your game. And last, but not least, it’s where you can keep the most revenue from each sale, giving your fans the best way to support current and future development. In this article, we’ll cover how to get your website and related media ready for launch. A game’s website can be a crucial part of a successful lunch. You can use it during development to showcase your progress, build a following and community, take preorders, promote crowdfunding campaigns, and establish your brand. It’ll become the focal point for all your other efforts. The site will be linked to from press coverage, the marketplaces your game will be on, and many other places on the web. As such, it should be the central place where all information about your game can be obtained. Also, it’s easy to drown in a sea of other games when trying to promote your game’s page on big marketplaces such as Steam. However, you can build a permanent home for your game and generate direct traffic from search engines and media publications with your website. Clear Description: Before giving paragraphs of detailed information about your game, explain what it is in a sentence or two. Make sure that brief description is towards the top of your website. Once you’ve done that, you can go into more detail in another page or section. Platforms / Requirements: Tell visitors what OS and system requirements are necessary to play your game. Development Blog: Keep a development blog to give people a behind-the-scenes look at how your game is being made. Find out why blogging is a good idea for game devs here. News / Updates: Have a separate section on your website for news and updates. If you lump them together with your development blog, important news might not get the attention it deserves. Media: Screenshots and videos give people their first impressions about your game and are a primary factor for purchase decisions. We’ll cover what makes good screenshots and videos below. Press Materials: Compile information about your game, as well as screenshots and video, into a press kit. 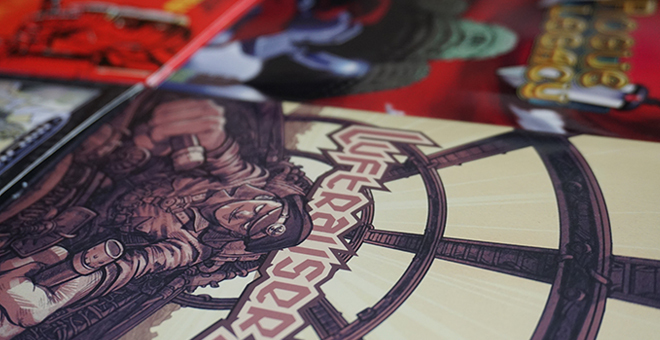 We’ll cover what you need to know about press kits and press pages later in the article. Social Media: Link to your Twitter, Facebook and other social media accounts so fans can follow you on their platforms of choice. Marketplace Listings: Don’t just tell people what your game is about, tell them where they can buy it, too! And, of course, list how much it costs. Store: Don’t rely only on marketplaces like Steam for your sales – you should also sell your game on your own website. By doing so, you’ll get to keep the chunk of revenue that marketplaces charge, while building direct relationships with your fanbase. If you’re interested in going that route, that is exactly the service we provide for software/game developers, so check it out. Your site’s design isn’t necessarily the highest priority — just take a look at Minecraft’s — but it deserves some thought. After all, it can give you a valuable edge. Let’s take a look at some indie game websites that have particularly good websites. Divinity: Original Sin‘s website sets the mood with full-width background concept art. At the forefront of the site, a trailer video awaits potential players — unfortunately, it blends a little too well into the site, and might be missed by less perceptive people. Around the video, critical acclaim from a host of game review sites drives home the positive reception the game received. 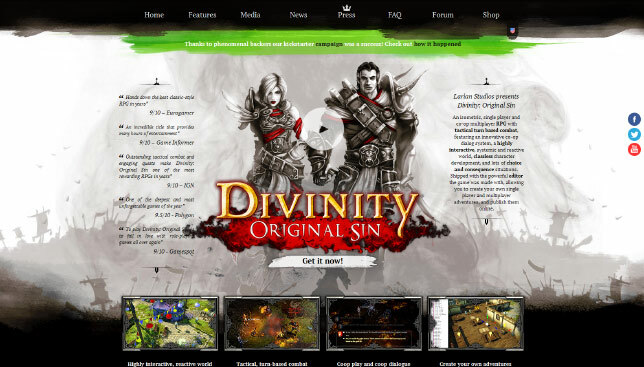 Divinity’s site covers all the basics: a “features” page showcasing many aspects of the game, dedicated media sections with tons of additional screenshots and videos, a regularly updated news section, a forum, and a link to purchase the game. Despite the obvious effort that went into the website, Larian Studios doesn’t sell directly, instead driving visitors to Steam or to the Humble widget. Speedrunners site is quite stylish, and starts by immediately showcasing gameplay using a background video. Right above the video, call-to-actions button enable visitors who know what they want to get the game immediately. 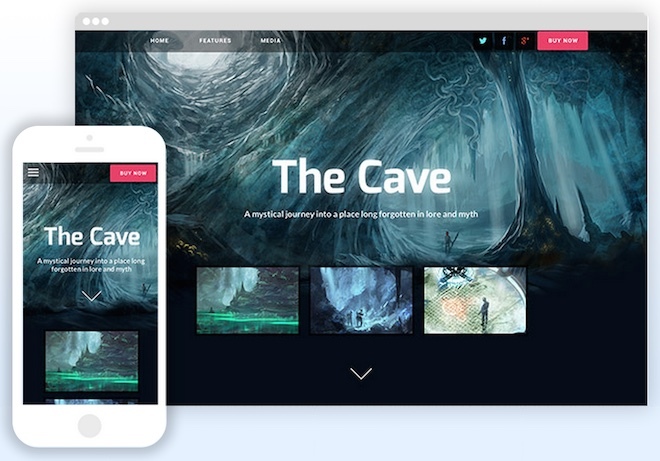 Below the main header element, different sections are dedicated to media, community, features and more – each with their own unique styling, based on elements from the game. Unlike Divinity: Original Sin, Speedrunners does sell directly using a payment form on Clickbank which gives you access to a steam key (presumably through the Steam API). The Clickbank payment page is a somewhat unusual choice, since the URL is different from the site and it’s not a very well known external payment service like PayPal. 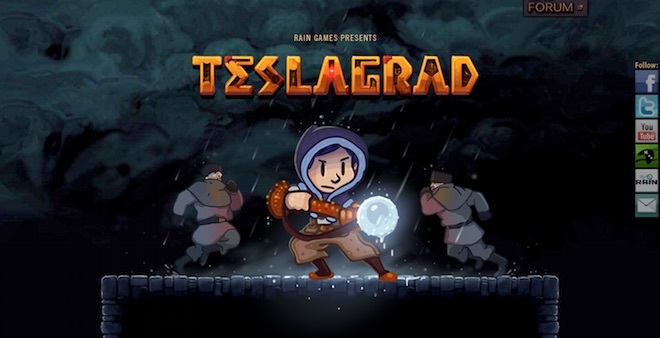 Teslagrad takes a more atmospheric route, drawing people into the game with visuals heavily linked to the game. The game’s main character appears in an illustration at the top of the website, just above a trailer. Scroll further down and you’ll see what platforms the game is available on, where you can buy it, additional story information and screenshots. A visitor’s first impression of your site often affects how much they’re willing to pay for your game. With our own game-oriented templates, we focused on showcasing game visuals via screenshots and videos, in a polished, professional design. Some elements, such as the pricing section, were based on industry standards such as Steam’s. We have both a dark theme and a light theme to suit your game’s visuals and atmosphere. Aside form showcasing your games, a Binpress store site also provides a checkout flow, license key management and a client portal for game owners. You can never underestimate the power of a trailer. Not only will it introduce people to your game via your website, but it will be embedded on blogs and shared all over. What’s more, many people will watch videos before even reading a word about your game on a press outlet or even your own site. Kert Gartner, who’s made trailers for games such as Aquaria, Luftrausers and Seplunky, has put together an extensive guide on how to make video game trailers. We’ve condensed the highlights here, along with a few other tips. Length: You don’t need more than 90 seconds to get people interested in your game. If you think you do, you might really be boring viewers instead. Get to the point: Don’t show logos for your development studio and waste time with a Hollywood “In a world…” voiceover sequence. Gameplay: Show gameplay mechanics in action, but don’t reveal everything. You have limited time and want to leave viewers curious and hungry for more. Solid Music: Bad to middling music isn’t necessarily a deal breaker, but great music can make everything more enjoyable. In fact, it might even encourage a rewatch. Just take Fez‘s PAX trailer for example. Tell a story: There’s only so much story telling you can do with 90 seconds, but the key is to make sure your footage builds in action, has a climax, and some sort of conclusion. Ending Information: At the end of your video, be sure to include your game’s Title, availability, website and supported platforms. High-Quality Footage: Not only should your footage have as little video compression as possible, but it should capture moments that perfectly demonstrate the game mechanics you want to highlight. Spend at least a whole day capturing footage. Distribution: Make sure your trailer can be streamed on YouTube, as well as embedded on other sites. Also, offer a download of your video for others to download. Bloggers often prefer to upload videos to their own streaming solutions or video players. Of course, you can always call in the professionals to make a trailer for you. Kert Gartner and James Id are two that would be happy to help. Traditionally, a press kit is an all-in-one zip file of information and media that makes it easy for journalists to write about your game. Rather than having to waste time hunting for screenshots, videos and information about your game, journalists can simply refer to to the kit. What’s more, it saves you from having to compile all your assets separately for each and every member of the press. The easier you can make a story to write for a journalist, the more likely it is they’ll write about your game. You can also dedicate a full page on your website with the same information as the press kit – this can make it easier to consume for journalists with little time, and can also be picked up by search engines for additional organic traffic. Again, the key is to make it incredibly easy for people to find out more and write about you. With that in mind, you should also offer all assets in a zip file on your press page for the sake of convenience. What’s more, press pages aren’t only important for launch. Bloggers who find your game at a later time will have easy access to all the information and media they need to write about your game. Press Release: This is where you give the press a summary of the news. Answer the basics: What’s your game about? When does it launch? What platforms is it available for? How much is it? Where can people buy it? We’ll cover how to write a press release in the next article of this series. Screenshots: Your game will likely make its first impression on potential customers with a screenshot, so make sure each one shows off how exciting your game can be. In other words, avoid focusing on anything boring: menus or shots that otherwise aren’t interesting. Remember, make sure your screenshots aren’t watermarked and have large dimensions. This will help writers meet the image size requirements of their publication, and maybe even encourage them to create a gallery. Videos: Trailers are just as important as screenshots, if not more so. Remember, show gameplay and feature things that will get them excited. Whatever you do, don’t make your video boring or drag on too long. Previous Coverage: If you’ve already gotten some press coverage from well-regarded wbesites, link to it! This will help lend credibility to your game, your studio and yourself. The folks at Vlambeer, the studio behind games such as Luftrausers and Super Crate Box, have put together presskit(), a free press page template for indie game devs. The template can create a press page for your studio and each of your games. Just take a look at Vlambeer’s studio page and its section for Luftrausers. If you need some more inspiration, check out the press kits for Octodad and Hundreds. In the Part Two of A Guide to Launching Indie Games, we’ll cover how to contact the press for launch day. Do you have any advice, tips or tricks on making websites, creating trailers or taking screenshots for indie games? Let us know in the comments! This post is meant to be a living guide, so we’ll add more to it as time goes on. Your wisdom might just get included, too.